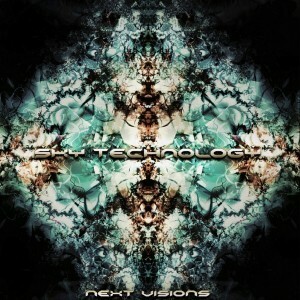 Ukrainian producer Sky Technology (Dmitriy Kolosovskiy) returns in 2011 with Next Visions, a set of four new songs released on the highly acclaimed Neogoa netlabel. Sky Technology made a strong debut in 2010, appearing on compilations from Neogoa and Phototropic Records as well as releasing Time And Space on UAF Records. Since then his distinctive approach to new school Goa trance has crystallized, yielding creative results that will surely delight his growing fan base. Mastered by Deimos with cover artwork by Richpa. Released under a Creative Commons licence for noncommercial usage. Be sure to check out the entire Neogoa discography here on Ektoplazm if you enjoy this release. amazing strong and fast !!! Track #3 is really awesome! definitely fills that hole for spirally goa! The music is very cool! i love the dramatic of galactic traveler … a bit too high frequencies though … but there is a great and heartily melody behind ! I’ve always appreciated Sky Technology, and this much anticipated album is quite worth the wait. 3rd song = Complete mind blow for the ages. Очень круто! :) Вот этот альбом надо на главную страницу в самое начало вставлять. GREAT ALBUM BOMB :D +5 Goa Trance Forever ! You got all my respect ! What a banging EP !!!!! Great music :) I’m happy there are some artists trying to make original oldskool/newskool. Your music makes me wanna dance and go crazy! absolutely amazing!! 3rd track is my favorite, though i loved all of them! Colossal work! I expected nothing less from mr. Kolosovskiy! Track 2 is amazing ! Pretty nice NewAge-Electro Future Goatrance ( Sky Technology makes btw the most carzyst and spaciyest Electro-Future Goa i ever heard so Respect!) Track 4 is really nice Downtempo too so good to lisen after the 3 Tracks before:) A nice Cover also. Damn! That is F-ing Epic!!! Love it!!! Трек № 4 – улётная вещь!!!!!!! Wow! So impressed by this! With the blasting opening of Om to the slower tempo of Galactic Traveler, this release takes you on a mind-melting journey through some very good goa. Highly enjoyable! And P.S. Richpa makes some really lovely cover art.